BOX OF WONDERS Nov 2011 issue of DDMagazine, originally uploaded by Daydreaming Project. 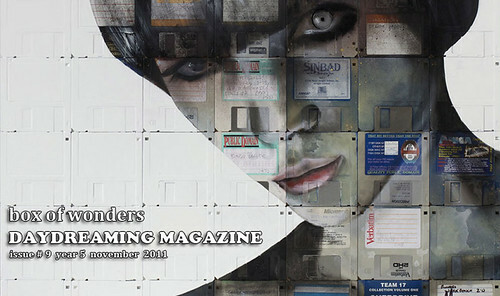 Nov 2011 issue of DDMagazine is on-line! Official photographer of festival Dance Open of S.Petersburg, author of several shoots at the Maryinsky Theater, presents some of his works in b/w very close to intense drawings that reveal unusual aspects of stage. “In creating art, I search for balance between truth and fiction, nature and fable, pathos and the grotesque … (Monika Jezusek). The polish artist tells in a photografic set about human condition with marionette and theatrical mask. “Nick Gentry is a British artist from London. … He is best known for his floppy disk paintings, placing an emphasis on recycling and the reuse of personal object as a central ttheme”. The images featured are a reflection about contemporary world between memory and loos. “Dean McClelland is a Canadian artist who lives in Calgary. .. you will find whimsy, humor and a quirkiness in his photography and fused with a sense that not all is right in this world. “.Artist presents his images as a grotesque wicked ‘s theater. Born in Malcontenta (near Venice), where he lives and works. His paintings have a realistic poetics and draw inspiration from social, popular and ethnic themes, where a subtle irony try to prevail over serious contents.